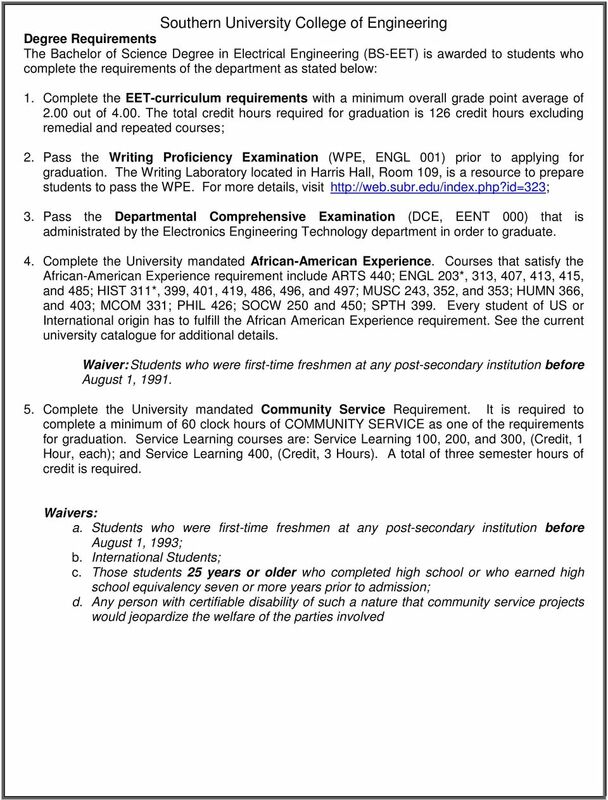 Download "Southern University College of Engineering Electronics Engineering Technology Department COURSE PRE-REQUISITES Course ID Course Title"
3 General Education Requirements ~ All students entering the EET department in the Southern University College of Engineering must complete a general education component, which is discussed below: 1. At least six (6) hours of course work in the Humanities are required. These six (6) credit hours must be in history and may be selected from the following courses: History (HIST 104, 105 or 114, 115, 311*). 2. Three (3) hours in Literature to be taken from: ENGL 201, 203*, 204, or Six (6) hours of course work are required in Social Sciences of which three (3) hours must be Economics (ECON 205). The remaining course must be selected from among the following series of courses: Economics (ECON 210, 370); Geography (GEOG 210, 221, 401); Political Science (POLS 200, 210, 320, 402); Sociology (SOCL 210,324, 448); and Psychology (PSYC 210, 315, 350). 4. Three (3) hours of course work are required in the Arts and are to be taken from among the following series of courses: Fine Arts (ARTS 200, 210/211, 320, 330, and 440*); Music (MUSC 200, 250/251, 352*, 353*); Speech and Theater (SPTH 360). 5. Two (2) hours of course work are required in Health or Physical Education and are to be taken from among the following series of courses: Physical Education (PHED ) or Health (HLTH ). 6. Fifteen (15) hours of course work are required in the Biological and Physical Sciences, with a laboratory experience. Eight (8) hours must be taken in a two-semester sequence of Physics courses; lecture and laboratory (PHYS 141, 142) and four (4) hours must be taken in Chemistry courses (CHEM 132 and 112). Three (3) hours of life science course work are required and may be selected from the following Biology courses: (BIOL 104 or 105). 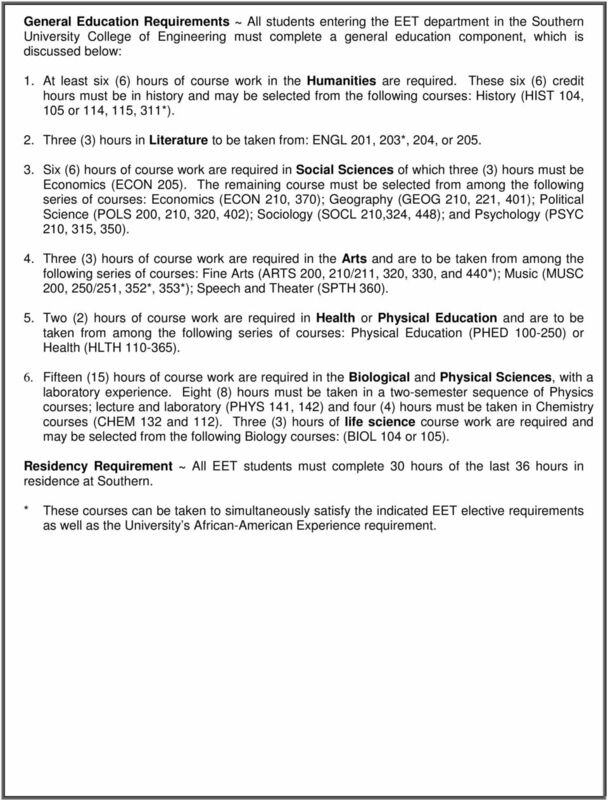 Residency Requirement ~ All EET students must complete 30 hours of the last 36 hours in residence at Southern. * These courses can be taken to simultaneously satisfy the indicated EET elective requirements as well as the University s African-American Experience requirement. 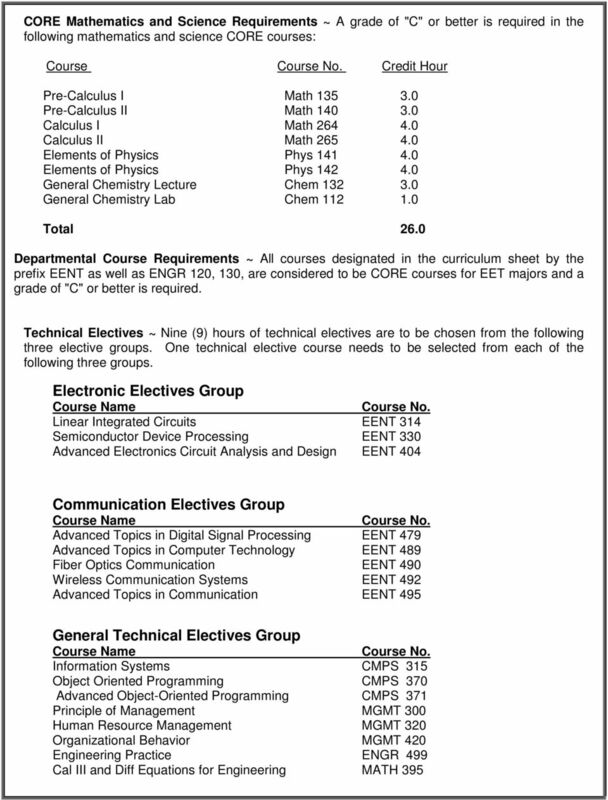 5 Selected Topics in Electronics Technology EENT 434 NOTE: The courses listed under Electronic Electives, and Communication Electives may also count as one of the General Technical Electives, however, a single course cannot meet the requirements of both elective groups. Transfer Credits Transfer courses can be substituted or used to satisfy the requirements for engineering or engineering technology courses if, and only if: The course contents, rigor of presentation, and prerequisites are equivalent, and Transfer credits come from engineering technology programs that are accredited by ABET. * For transfer students, any ELEC course may be substituted for ELEC 1201. 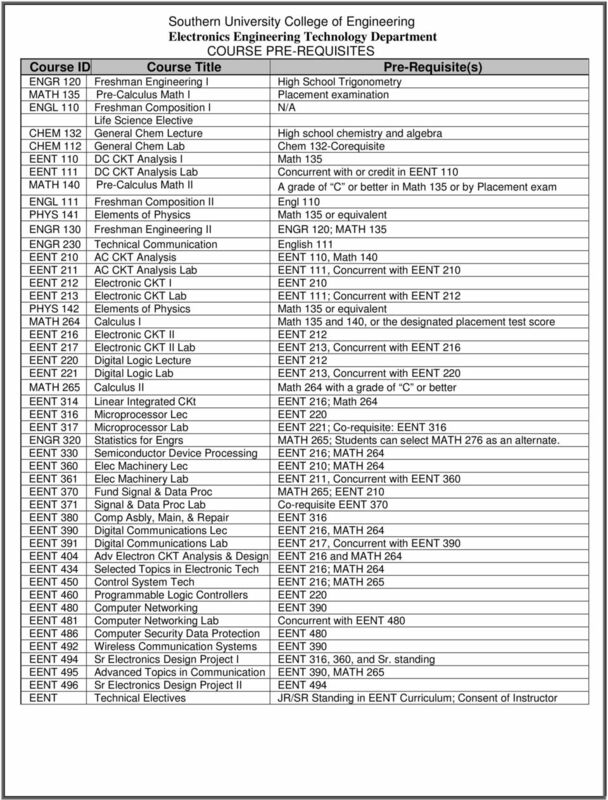 ELECTRICAL ENGINEERING, CONCENTRATION COMPUTER ENGINEERING ACADEMIC MAP: DEGREE BS (128 CREDIT HOURS) This degree map is a semester-by-semester course schedule for students majoring in Electrical Engineering. 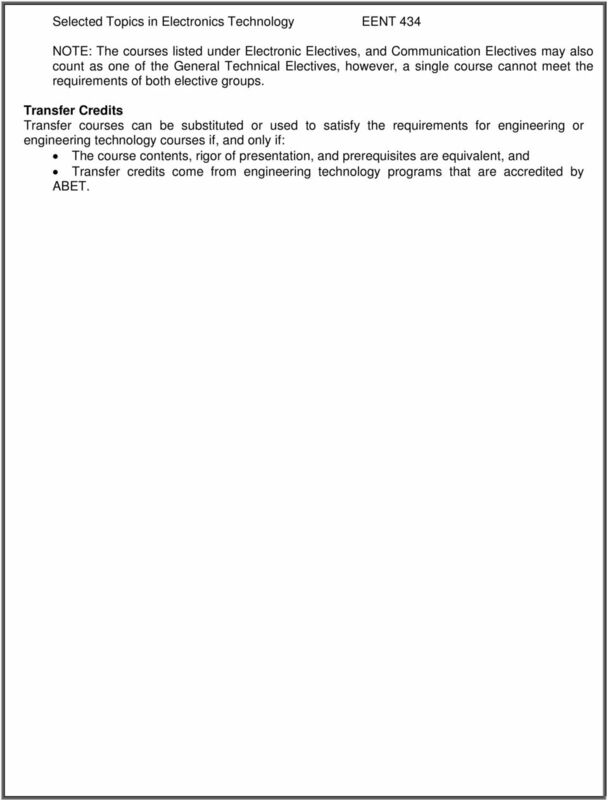 Plan of Study for Acoustical Engineering Concentration in Multidisciplinary Engineering. 120 credits. ABET accredited (BSE).